On Monday, I discussed "pox parties" and "measles teas", social gatherings where parents get their unvaccinated, nonimmune children together with another kid who has a disease, the purpose being to intentionally infect their kids and make them sick. It is a practice that, for at least a hundred years, has been decried by the scientific and medical community as a wretched idea, with one author describing them as "orgies of death". Indeed, in my opinion, these parties are nothing more than child abuse. Measles cases in all developed countries became much milder than in developing countries mainly due to improved diet. Is it logical that deaths associated with measles declined greatly without any corresponding decline in incidence? That is, quite simply, false, not to mention sloppy thinking. Second, it ignores the non-fatal, but still quite serious, complications of diseases, such as severe dehydration, pneumonia, deafness, blindness, encephalopathy and permanent mental impairment, among others. And, yes, these diseases can still kill, even in developed nations with good healthcare like the United States. 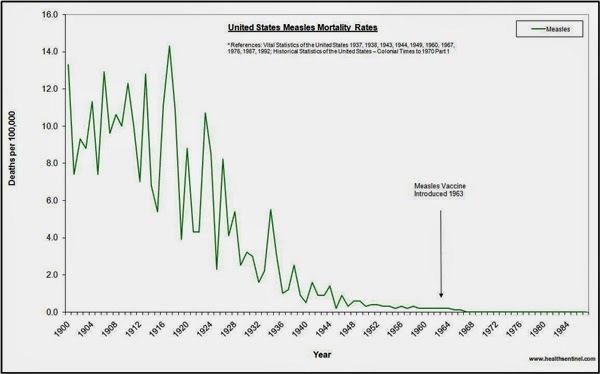 I will readily admit, the measles vaccine did not contribute to the decline in deaths seen before the vaccine was licensed. (Duh!) But while anti-vaccine activists assert that the disease just got less dangerous on its own, they're wrong. Here's why. Source: Barkin RM (1975). Measles mortality:a retrospective look at the vaccine era. Am J Epidemiol. The second graph also shows that although deaths from measles declined, the incidence, that is, the number of cases, remained quite steady until about 1963, when the first measles vaccine was approved. One other thing to note in this graph. Sometimes, anti-vaccine folks will simply draw a straight line following the general slope of the data and extrapolate that by 2010, measles would not cause any deaths and would be gone on its own. But that ignores changes in medical care that occurred over that span of time, as well as ignoring changes in the slope itself. We see, for instance, that there's a gradual decline until the early 1920s, then a slightly steeper slope until the late 1940s, with a leveling off in the 1950s. A perfectly straight line just doesn't fit, at least if one is being honest. We see a precipitous drop in the number of cases around 1963. Notice, also that while death rates had been declining, those also dropped about ten-fold in the space of a few years. Compare that to the pre-vaccine era, where it took decades for an equally great drop in death rates (e.g., 1918-1943 and 1943-1967). That impact is something that you don't see in the graph favored by anti-vaccine folks. For this post, though, I want to focus on that gradual pre-vaccine decline in mortality. What should be clear is that although the incidence in diseases did not change before the introduction of the vaccine, mortality was decreasing. Was the virus changing; did it becom less virulent? Did the virus stay the same while we just got better at keeping patients alive? Ask an anti-vaccine advocate what happened, and you're likely to get an answer that the virus itself was getting less deadly (i.e., less virulent) or that improved diet, sanitation and hygiene are what did it. Or some combination of those two. Period. End of story. The scientific literature paints a slightly different picture (surprise, surprise). The early part of the 20th century saw a lot of significant changes affecting the way we live. Diets progressively improved, sanitation got better and overcrowding declined. These did have a big impact on overall health of the population. Malnutrition contributes to more severe courses of disease and increased mortality. Poor sanitation can increase the incidence of diseases spread via contaminated food or water, though not respiratory diseases like measles. And overcrowding creates conditions where there are many opportunities for a disease to find new hosts, spreading rapidly. Of course improvements in these areas would also contribute to improved outcomes following infection with a disease. But they only account for a portion of the measles mortality picture. In the early 1900s and continuing through the middle part of the century, most measles deaths were not from the virus itself. Rather, secondary bacterial infections contributed significantly to the high mortality rate following measles, the most common of which is bacterial pneumonia (Babbott & Gordon, 1954). Common opportunistic bacteria to cause complications were streptococcus, pneumococcus and H. influenzae. In the first decade, there were no antibiotics that could treat these secondary infections, and for a number of years afterward, the antibiotic arsenal was limited. The only control measures available were imperfect attempts at quarantine to limit outbreaks. But given measles' ability to spread before symptoms appear, such attempts were more or less futile (Curtis, 1916). Outbreaks simply had to run their course, and families had to hope that their children would survive. The advent of antibiotics, however, gave a new tool to drastically reduce the impact of secondary infections. Drugs to wipe out these pathogenic bacteria were a boon to doctors and their patients, allowing for a significant cause of death following measles to be virtually eliminated. Another medical intervention which had a big impact on measles mortality was the use of gamma globulin. 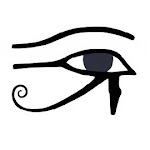 There were essentially two ways to use gamma globulin: temporary prevention of disease or modification of disease. In both cases, it was given to those who had been exposed to the virus. For prevention, it had to be given within 6 days of exposure (Janeway, 1945). If a sufficient dose was given soon enough, there was a decent chance of preventing the infection from taking hold. The good side is, the child would not get sick and be at risk for complications, like death. The bad side is that the immunity would only be short-lived; eventually, if re-exposed, the child could be infected again. For that reason, the dominant recommendation for gamma globulin was to use it to modify, rather than prevent, the illness. A smaller dose or one given too late for prevention could make the course of measles milder, while also allowing the patient to develop immunity to the virus. Although this could make the incubation period for the virus longer, the recognizable disease would have a shorter duration and much lower risk of complications. (Janeway, 1945). Other serum products, predating gamma globulin use, also had potential to prevent or modify the disease, though not as safely or effectively as gamma globulin (Babbott & Gordon, 1954). Modified disease, however, was still transmissible. These products, though, were not particularly cheap and did carry a risk of some serious side effects. They had to be used judiciously. Another aspect that likely contributed to the declining death rates from measles were fertility and family size. From the beginning of the 20th century until the mid-1930s, birth rates steadily declined, leading to fewer children per family (Guyer, Freedman, Strobino & Sondik, 2000). This pushed the median age of infection off until children were slightly older. The shift in age of infection was hypothesized to have played a significant role in the reduction in infectious disease mortality (Reves, 1985), considering how dangerous measles was for those under 3 years of age (Henry, 1921). A final factor that likely played a large role in the reduction of deaths from measles, particularly in the first few decades of the 1900s, was the establishment of local health departments and improved access to health care (Guyer et al., 2000). Local health departments could help to educate the populace about diseases and how to minimize the risks of exposure and infection. Over this period, as well, improvements in neonatal and postneonatal care reduced mortality and improved the overall health of infants. Increased access to health care for infants and young children could address conditions that might have otherwise contributed to complications of measles, just as measles could negatively affect the course of other diseases, such as tuberculosis (Babbott & Gordon, 1954). A couple things that did not change were the virulence of the virus (Babbott & Gordon, 1954), nor the risk of encephalitis, at about 1 in 1,000 cases (Babbott & Gordon, 1954; Perry & Halsey, 2004; Griffin, 2010). And while the risk of death has dropped significantly, it is still somewhere around 1 in 1,000 cases to 1 in 3,000 cases here in the U.S. The history of measles mortality in the pre-vaccine era is rather complex; it's not simply a matter of better food and sanitation. While improvements in overall nutrition, sanitation and housing/overcrowding did contribute to improved health outcomes early in the 20th century, they are not the only factors that played a role in the declining mortality following measles infection. Advances in medicine and healthcare, the use of gamma globulin and other serum products, the advent of antibiotics, improved education and decreases in family size also helped to make measles a less fatal disease. However, it is difficult to quantify the exact degree each of these factors played, since we are dealing with historical data of oftentimes varying quality. I would argue, though, that if I had to choose one intervention that has had the most impact on measles deaths throughout history, I would pick vaccination. After all, if you never get infected with it, you can't die from it. Babbott, FL Jr. & Gordon, JE. (1954). Modern measles. Am J Med Sci. 1954 Sep; 228(3):334-61. Barkin, RM. (1975). Measles mortality: a retrospective look at the vaccine era. Am J Epidemiol. 1975 Oct; 102(4):341-9. Curtis, FG. (1916). Is the control of measles and whooping-cough practicable?. Am J Public Health (N.Y.). 1916 Mar; 6(3):265-68. Griffin, DE. (2010). Emergence and re-emergence of viral diseases of the central nervous system. Prog Neurobiol. 2010 Jun; 91(2):95-101. Guyer, B, Freedman, MA, Strobino, DM & Sondik, EJ. (2000). 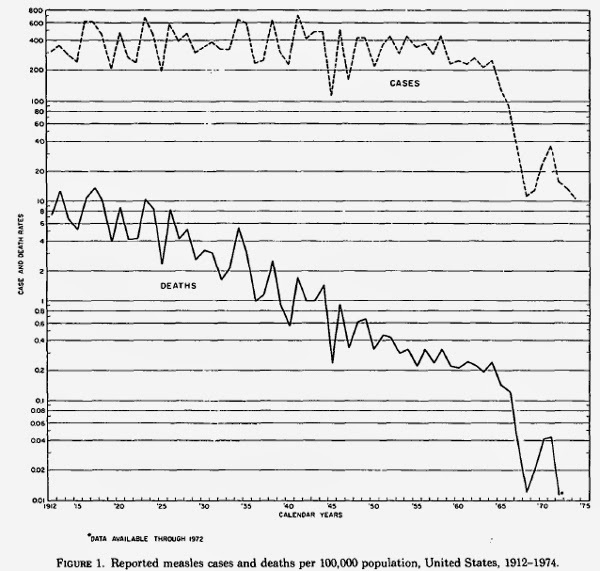 Annual summary of vital statistics: trends in the health of Americans during the 20th century. Pediatrics. 2000 Dec; 106(6):1307-17. Henry, JE. (1921). A brief statistical study of recent experience with measles and whooping cough in Massachusetts. Am J Public Health (N Y). 1921 Apr; 11(4):302–306. Janeway, CA. (1945). Use of concentrated human serum γ-globulin in the prevention and attenuation of measles. Bull N Y Acad Med. 1945 Apr; 21(4):202-22. Perry, RT & Halsey, NA (2004). The clinical significance of measles: a review. J Infect Dis. 2004 May; 189 Suppl 1:S4-16. Reves, R. (1985). Declining fertility in England and Wales as a major cause of the twentieth century decline in mortality. The role of changing family size and age structure in infectious disease mortality in infancy. Am J Epidemiol. 122(1):112-26. I agree, especially with your last sentence. When you look at the havoc that measles still causes in places where vaccination does not occur (and the 100,000+ deaths yearly that measles still causes), why would anyone want to stop vaccinating against this awful infection? 100,000 deaths out of 8 billion people? you missed the point the writer actually proved for anti vaccination. The death rate dropped dramatically in the US. You ever think that maybe thats the way natural selection happens.. Maybe we would not be over populated and a healthier society today because we would be naturally immune and have life long immunities to these issues.. I am sure at least most of those 100k deaths are in countries that have little to know nutrition in their diets or sanitary as we are in the US and other modern countries.. Measles is not as dangerous as the media makes it to be.. Plus you pro vac people.. never consider that each individual is different and each body responds differently to Vac. Just like medicine one person can respond horribly to a treatment and other respond fine.. the info most of you people get on Vac is the CDC or WHO which are bought out by big Pharma who do you think pays them to stay open? for example in this one particular health documentary for nutrition we find that the WHO came out with a paper with the true facts about Calorie intake and the cause of health issue.. Guess who made them change that study or loose funding the Junk food corporations.. you pro vac assume the people that are supposedly looking out for our health are moral people un wavered by the bribe of the mighty dollar.. you assume the info from the CDC and WHO is fact.. in reality you dont know.. you can only hope.. and like good sheapole believe what your told without question..
You're using the wrong denominator. This is a common mistake among anti-vaccine activists. The reason you can't compare to the total population of the planet is because a sizable portion of those 7.4 billion (not 8B as you suggest) are already immune due either to previous infection or vaccination. You need to look at the number of deaths out of the total number infected. It's also rather disturbing that you take a rather eugenicist viewpoint. That is a viewpoint that is both callow and mistaken, since it ignores a good chunk of how natural selection is operating. If left to nature, yes, humans' immune systems would develop methods of dealing with measles more efficiently. But, measles would also counter to avoid those methods. We're not the only ones evolving; the virus also evolves. As for deaths, I recommend you take a look at the U.S. for a moment. With the number of cases since 2000, we've had a death rate of around 5 deaths/1,000 cases. And that is just deaths. You may have missed the point about there being other complications that are not fatal but are nevertheless quite serious. Finally, for one who accuses others of making assumptions, you make an awful lot yourself. We (or at least I) do not claim that every single person reacts the same to the vaccines. If we did, then we wouldn't bother noting medical contraindications, would we? Nor do we simply believe what we're told. I actually look at the evidence, rather than simply trusting what I read on the web. That seems to be more the behavior of the denizens of Age of Autism, NVIC, and the like, who will blithely copy-paste some journal article they were told supports the anti-vaccine ideology. Yet when one actually reads the article, one finds that it contradicts the AV claim. But it's nice to see you lack the creativity to avoid descending to the pharma shill gambit. Which evidence btw? How do you choose which claims to believe in? What year did medical care get kicked off? Was it before or after 1950? Give a specific year and what prompted the great improvement outpacing all others. If you say after 1950, I have a list of history books for you to read. You can start with this 1920s classic. Hi, Dana. First off, would you mind providing a citation for your 108 figure. If VAERS is your only source, then I humbly suggest you learn a bit more about what VAERS does and doesn't say. The Philippines is still recovering from a major outbreak in 2012. They still have endemic transmission and have not eliminated the disease. Furthermore, the current measles outbreak in the U.S. stemming from Disneyland is not the vaccine strain. The vaccine uses the A genotype. The current outbreak is the B3 genotype. And before you claim that means the vaccine is ineffective, there is only one known serotype of virus, meaning that the vaccine protects against all of the genotypes. As with your death figure, do you have a citation for your claim about decreased natural immunity and it leading to increased cancer, obesity, IQ reduction, etc.? Regarding your, "if vaccines work" comment, I suggest you read this. Keep in mind that hundreds, if not thousands, of people were exposed at Disney. If the vaccine did not work, then we would be seeing many, many more cases of vaccinated individuals getting sick, and the outbreak would be significantly larger. If you have actual scientific evidence to back up your claims, by all means present it. If it is valid, I will change my position. fine, vaccines reduced incidence rate, but deaths were still very low when it was reduced. I think compared to the number of people who die in other ways (homicide for example, or car accidents) and the alleged negative effects of vaccines, it is not a number to get hugely alarmed about. I speculate with today's better health care deaths would be even lower. A couple things to keep in mind. I just recently took a look at the National Vital Statistics System to search for deaths related to measles. From 2000 to 2013, there were 10 measles-related deaths in the U.S. reported in the NVSS database. Now, I was only able to confirm 2 of those deaths from other sources. In that same period, there were 1,243 cases of measles. That gives us, on the low end, a death rate of 1.6 deaths per 1,000 cases of measles. That number is only for deaths and does not include other serious but non-fatal sequelae, such as brain damage, deafness, pneumonia, or hospitalization for other consequences of the disease. If you can show that the vaccines have similarly high rates of death and serious injury, then perhaps your argument might have some weight. So that's the first thing. Second, just because people die in other ways doesn't mean that we cannot also prevent causes of death where we can. Just because a lot of people may die or be injured in car accidents doesn't mean that we should abandon the effort to prevent measles. Thanks Todd for the condescendingly pseudo-scientific reply. You probably also believe in global warming, evolution as well as the medical establishment communal positions that the mercury, aluminum and other ingredients in vaccines are good for your body. You fail to take into account that several generations of vaccinated people has resulted in reduced immune system performance and increasingly needed extra doses of vaccines for the same disease. Your medical establishment propaganda efforts fail to convince anyone with a critically thinking brain. Keep selling your bs to the brain-washed, vaccine impaired masses that comply without critical analysis skills in their degraded thinking processes. There is plenty of scientific criticism of vaccines out there but you still fail to avail yourself of it or give it any credence. You are part of the problem whether you know it or not. Perhaps your livelihood is dependent on promoting the efficacy of vaccines? So if one child is harmed by vaccines is it worth it Todd? If it is your child that is harmed by a vaccine is that acceptable to you? How about abortion Todd, is that also okay with you? Is it okay with you that tens of thousands of people suffer from harmful vaccines provided by Bill Gates is that okay with you? Population control anyone? You are probably okay with forced vaccination as well? Please tell us which MMR vaccine contains thimerosal and an adjuvant. Then provide the PubMed indexed studies by reputable qualified researchers that the MMR is more dangerous than measles, mumps and rubella. Or we will just assume you work for Big Hospital Supply, and want to sell more child sized ventilators. One thing that is not addressed, probably because there is no way to prove or disprove it, is the fact that the kids who have an adverse reaction to the measles vaccine may have had an adverse reaction to getting the measles.....so in fact the outcome would be the same either way. We'll never know though, will we. I don't know how old you are but I am sorry to inform you that prior to the mid Seventies at least and perhaps in some countries the late Seventies, doctors fully supported 'parties' to spread infection for these minor childhood diseases on the basis that it was better to get it young and get lifelong immunity since all were more serious in adults. For which diseases and why? Provide the PubMed indexed article from the 1960s and 1970s that this was health policy in any country. It includes some quotes from the early half of the 1900s, in particular, one from a doctor who described pox parties as "orgies of death". While some doctors did recommend exposing kids to those who had chicken pox so they got it sooner rather than later, the best thing was to avoid it completely if possible, since chicken pox is not without serious risk. I'd also recommend reading the Pink Book chapter on Varicella, as well, to get a better idea of the complications of the disease. As for measles, the topic of this post, I'm not aware of any doctors recommending "measles teas", but I am aware of doctors who had argued against them. Measles had a greater risk of serious complications than chicken pox and is much more contagious. Now, even if some physicians did recommend exposure through "parties", that doesn't mean that it was a good idea. In fact, any doctors who did so were seriously misguided, particularly since in the late 1970s there was an effective vaccine available. In my country, it is still popular to deliberately get infected with chicken pox while you are young. Parents do that their kids. Chicken pox is considered harmless disease, less dangerous than flue. Is not the real question for your graph, why, after the introduction of a measles vaccine in 1963, did it rise again dramatically, 68-72? Because the vaccine coverage was very spotty, and 1970 was an expected epidemic year. 1) There were two measles vaccines introduced in 1963: an inactivated vaccine and a live attenuated vaccine (several different companies produced these). The inactivated vaccines was not very effective and was withdrawn in 1967, so those who received the inactivated vaccine had a greater risk of vaccine failure. 2) When first introduced, the recommended age was 9 months. It wasn't until 1965 that the recommended age was changed to 12 months. The vaccine, as we found out through many studies, is less effective if given before 12 months. Again, those who were immunized early were at greater risk of vaccine failure. 3) It wasn't until 1966 that a nationwide effort was made to eliminate measles, so, as Chris pointed out, vaccine uptake was spotty until several years after that goal was set. 4) It wasn't until 1989 that a second dose of measles vaccine was recommended. Like age at first immunization, several studies led to the discovery that a single-dose schedule had a higher rate of vaccine failure than a two-dose schedule. Those are vaccine-related factors that played a role in that small (in the grand scale) uptick in the late 60s/early 70s. There may also have been other factors (e.g., socioeconomic, demographic) that played a role, too. "I don't know how old you are but I am sorry to inform you that prior to the mid Seventies at least and perhaps in some countries the late Seventies, doctors fully supported 'parties' "
I wish you could provide some corroboration for this statement. All of the childhood diseases we suffered in the 1950's and 1960's we (my six brothers and sisters and I) managed to catch without the help of 'parties.' With measles in particular, no such events would have been necessary, as one infected child in a school would have passed the disease on to 80% of the other children in his or her classroom. Do you have documentation supporting the existence of these parties and the medical support for them? If we look at UK data, where a measles vaccine was introduced 5 years later (in 1968) than in the US, we see that the mortality had dropped further (down to 1 per million). We have no reason to suppose that the US measles mortality rate would not have also dropped further (as did the UK) without the 63 vaccine. Now if the death rate dropped to 1 per million due to factors such as; more replete nutritional, hygiene improvements (i.e. plumbing), and ‘bottom of cliff’ medical treatment improvements (i.e. antibiotics), and was STILL dropping at vaccine introduction in 68, then it follows that this remaining 1 per million would also likely continue to drop to near zero (suppose to 0.1 per million) with increased improvements of these factors. Without a control population, it is impossible to ascertain that this remaining drop (tiny in comparison to the previous 50 years) would NOT have also occurred had the vaccine not been introduced. And yet when we look at the current mortality rates of measles among the sizable populations of unvaccinated individuals in US, UK, Europe, Canada, NZ etc, we see very few deaths in developed nations which fits my above hypothesis (largely nutritionally replete populations). So it simply MUST be acknowledged by responsible health care professionals that death by measles (not to mention the other vaccinated for illnesses) is practically zero for nutritionally replete individuals with access to antibiotics, plumbing, and so on. Publicly acknowledging this (rather than publishing alarmist posters in medical centers and so on) then affords an alternative to parents who prefer to ensure their children's health nutritionally rather than to attempt to do so via potentially risky injections. To attempt to paint an alarmist picture (that simply isn't true) is fraudulent, and as such it must be firmly challenged by those who are able to correctly interpret the data. I suggest that preventing infection (down to zero) may not only be impossible, but also an inadvisable long term goal. An alternate way to look at this is to further explore those nutritional factors that present between the fatalities and the full recoveries. In the developed nations we now have so few deaths by measles; we could easily investigate case studies of the nutritional profiles of each victim (few as they are). What I would like you to concede, is that the marketing (for instance in nearly every maternity ward or hospital I have seen, and also television advertising) which portrays measles (and other infectious illness) as being alarmingly dangerous, is a practice that is completely without justification. Just as a small example, in NZ (with approximately 10% unvaccinated) there is a child cancer death roughly every two weeks. There hasn't been a measles death in the last 10 years (as far as the Ministry of Health has reported). It is fraudulent for the ministry to be drawing the public concern to these comparatively non-issues, when other preventable illnesses are so much more prevalent. "If we look at UK data, ..."
Where is the link to that data? "And yet when we look at the current mortality rates of measles among the sizable populations of unvaccinated individuals in US, UK, Europe, Canada, NZ.."
Link to the data? Compare it to measles morbidity, and take into account community immunity... you did that where? "I suggest that preventing infection (down to zero) may not only be impossible, but also an inadvisable long term goal." Except that has been done for measles by vaccinating. And since measles only infects humans it is possible to eradicate it just like smallpox. Why would it be inadvisable to eliminate measles? What good can be had for having a child suffer for over a week with a high fever, and a one in twenty chance of getting pneumonia and a one in a thousand chance of getting encephalitis? "Just as a small example, in NZ (with approximately 10% unvaccinated) there is a child cancer death roughly every two weeks." So what? You are comparing apples and oranges. Also surviving measles can also have its costs, like blindness, deafness, and permanent neurological issues. "There hasn't been a measles death in the last 10 years (as far as the Ministry of Health has reported). It is fraudulent for the ministry to be drawing the public concern to these comparatively non-issues, when other preventable illnesses are so much more prevalent." What would be the level of measles without a vaccination program? And having measles cases including a death in ten years in a small country is too much, there should have been no cases of measles. What other preventable diseases out there that are more important measles? Remember measles suppresses the immune system for years after, causing greater mortality from other diseases. Mortality data is more significant because; firstly it more approximately correlates negative long-term outcomes, and secondly it isn’t gradational or (generally) less easily misdiagnosed than morbidity (i.e. acute measles infection/co-infection caused death is fairly easily differentiated from death by bone cancer, car accident, etc). However even mortality data is problematic unless we look at it in more depth so we can learn from it. And this is what I meant above. For instance if you read the text at the bottom of the data, you see that since 93, there were only 2 deaths due to acute measles infection, both in compromised children (one vaccinated(?) with a lung condition, one unvaccinated with a congenital immunodeficiency), with the remainder being non-acute measles ‘late-effects’ adults (what ages I wonder?). So in each of these (few) cases we could (ought) look at things such as vitamin A and C levels, vaccine history, past health history, and so on. If the adults who died of these measles ‘related’ deaths had prior issues such as nutritional deficiencies, historic trauma, or congenital disorders (such as did the two children), then we could be open to the possibility that given treatment or prevention of the underlying issues their lives/deaths could have been improved. One thing we see is that since 93, there isn’t a single case of an acute measles death in a previously healthy child (or possibly adult too?) in England or Wales. So out of approximately 100,000 measles infections (perhaps 5,000 -10,000 of whom would have been unvaccinated), no deaths in previously healthy individuals. And this fits my previous hypothesis that mortality (including long term complications) from infectious disease negatively tracks improved living conditions. Thousands of unvaccinated Westerers are currently being exposed to (and infected by) the measles viruses, with few (if any – show me some case histories if you can find any) serious consequences (for those without prior health conditions). Herein lies the fraud. This fact needs to be publicly disseminated instead of the alarmist posters we see in waiting rooms. And for those with underlying health conditions, we can explore ways that they can be further strengthened to better cope with various infections, because a vulnerable individual will be vulnerable to many different pathogens. Theoretically it may be possible for a future society to exterminate measles. However I see far greater priorities (cancer for instance) given there is every indication that the tiny risk that measles does pose can easily be averted with nutrition and improved living conditions. "Mortality data is more significant because; firstly it more approximately correlates negative long-term outcomes,"
What? How does mortality correlate with long term outcomes like blindness, encephalitis, paralysis, deafness and other issues caused by measles? Where are your citations? "If the adults who died of these measles ‘related’ deaths had prior issues such as nutritional deficiencies, historic trauma, or congenital disorders (such as did the two children), then we could be open to the possibility that given treatment or prevention of the underlying issues their lives/deaths could have been improved." PReally? How do you know,? Please provide those citations. Be sure to include a PubMed indexed citation that Olivia Dahl was starved because even though her father had an extensive veggie garden he refused to feed her. "One thing we see is that since 93, there isn’t a single case of an acute measles death in a previously healthy child (or possibly adult too?) in England or Wales." Citation needed. And why are you limiting that to one country? What about the USA and Germany which have seen a few deaths from measles due to SSPE. Are you cherry picking? "So out of approximately 100,000 measles infections (perhaps 5,000 -10,000 of whom would have been unvaccinated), no deaths in previously healthy individuals." So what? There were several deaths in France during their recent measles outbreak, plus at least one in Wales. Plus about one in ten of those who were infected with measles recently at Disneyland ended up needing hospital care. You are cherry picking. "However I see far greater priorities (cancer for instance) given there is every indication that the tiny risk that measles does pose can easily be averted with nutrition and improved living conditions." Prove it. You can only claim measles occurs in low numbers due to high vaccination rates. This is something you are dismissing. What are the numbers of measles morbidity and total disability (not just deaths) without a a vaccination program. You missed answering this very important question: "What would be the level of measles without a vaccination program?" You also missed answering this question: "Why would it be inadvisable to eliminate measles? What good can be had for having a child suffer for over a week with a high fever, and a one in twenty chance of getting pneumonia and a one in a thousand chance of getting encephalitis?" This was entirely from the above linked UK Govt page I was commenting on. "What? How does mortality correlate with long term outcomes like blindness, encephalitis, paralysis, deafness and other issues caused by measles? Where are your citations? " My words were that mortality "more approximately" correlates negative long-term outcomes (than does morbidity data alone). Death is the most severe (out of many) serious consequences of an acute measles infection/co-infection. "From 1956 to 1960 [US], an average of 450 measles-related deaths were reported each year (∼1 death/ 1000 reported cases) ... As a result of measles virus infections, an average of … 4000 patients had encephalitis each year"
This equates a late 50s death per infection rate of 1/1000 and encephalitis per infection rate of 1/113. Recent US morbidity (http://www.cdc.gov/measles/cases-outbreaks.html) is recorded as significantly lower than UK but if we look back 2000-2014 we see approx 2000 cases without death, so we can only 'guess' what current fatality rate per infection might be for US but it is somewhere below 1 death/2000 reported cases. When we look at UK fatality rate per acute infection (see age of death) we see significant drops especially from 1940 to 1990. From 93 onward there were only 3 deaths from acute infection out of nearly 100,000 cases (prior to 1990 a majority of the accounted deaths are acutely infected children). Fatality rate for acute infection in post 1990 UK may (depending on accuracy of the data) be in the region of 5 to 8 times lower than fatality rate was in the 1950s. So death per acute infection is (in the past 10-20 years) significantly lower than it was in both UK and US in previous decades. Encephalitus per infection is also significantly lower in recent years than it was in the late 50s (if we trust CDC and Orenstein's data). Now regarding Olivia Dahl, one cherry picked (assumed) anomaly (which may not even be an anomaly on closer inspection) does not a distribution curve disprove. My hypothesis that increased nutrition and overall living standard and health have (and will) reduce (to the point of eventual elimination) measles risk, is based on a gradually evolving distribution curve. Firstly we have no reason to assume anything about where any individual happens to sit on this distribution curve (until we measure their vitamin and nutrient levels and entire health and in utero history). And there will also be confounding variables which may be impossible to qualify and quantify. It is a bit like refuting a hypothesis that Y chromosomes eventually translate to increased physical strength, by claiming 'well I know a woman down the road who can lift ...'. throughout the great depression (when nutrition was typically poor). We also know she suffered serious cerebral aneurysms leading to significant brain damage at age 39 - a marker which could indicate chronic inflammation, nutritional deficiencies etc, which may have already been present while she was pregnant with Olivia 10 years earlier. We know that two years prior to Olivia's death her brother suffered serious accident caused brain damage (the stress of this event alone to the family and 5 year old Olivia may have lowered her still developing young immunity). Roald himself convalesced for months after a severe concussion during the war, and this may have resulted in personality changes that resulted in his future inability to co-create a happy functional family life - his daughter's writing (which co-incidentally I read years ago) describes the Dahl family life in a significantly darker tone than what his children's fiction may lead us to imagine. I have a lot more to write but today is Sunday and I have a family life to enjoy! Thank you for your response. Back tomorrow. Perhaps I should elaborate what I meant earlier re elimination. What I meant was that attempting to eliminate measles by reducing/avoiding exposure/infection may be an impossible and misdirected approach. My thoughts are instead to explore those variables between the full recoveries and the partial recoveries or deaths, and work at maximising the positive factors in global populations to the point that these viruses are no longer problematic (thus essentially eliminated). "This was entirely from the above linked UK Govt page I was commenting on." And yet a young man died from measles pneumonia in Wales a couple years back. That was during an outbreak of over a thousand cases with almost one out of ten being hospitalized. So in your world Wales is not part of the UK? By the way there have been deaths in the USA, mostly due to SSPE. There is a more recent article about them on this blog. I am still not clear what you are getting at, but just get to the point by posting the PubMed indexed studies by reputable qualified researchers showing the MMR vaccine causes more harm than measles, mumps and rubella. "My thoughts are instead to explore those variables between the full recoveries and the partial recoveries or deaths, and work at maximising the positive factors in global populations to the point that these viruses are no longer problematic (thus essentially eliminated)." If your thoughts are towards more kids getting sick than getting two doses of an MMR vaccine, then you are one not who does value child welfare. Nor one who understands both the emotional and financial costs of your meandering thoughts. J Infect Dis. 2004 May 1;189 Suppl 1:S131-45. An economic analysis of the current universal 2-dose measles-mumps-rubella vaccination program in the United States. No, he was included in that govt data. My statement still stands. "since 93, there isn’t a single case of an acute measles death in a previously healthy child (or possibly adult too?) in England or Wales." I wrote 'possibly', because I was not yet aware of his prior health state. I will discuss MMR and SSPE in detail when I have some time! "I wrote 'possibly', because I was not yet aware of his prior health state." Who are you to decide who lives and dies due to their "health state." That is a despicable way of blaming the victim. You seem to be under the illusion that measles is occurring in low number will still be the case without vaccination. Except history shows this is not what happens. This is what was behind the measles outbreak in Wales. It also happened in Japan. From Measles vaccine coverage and factors related to uncompleted vaccination among 18-month-old and 36-month-old children in Kyoto, Japan: " In Japan, measles vaccine coverage has remained low, and either small or moderate outbreaks have occurred repeatedly in communities. According to an infectious disease surveillance (2000), total measles cases were estimated to be from 180,000 to 210,000, and total deaths were estimated to be 88 [11,12]. Measles cases are most frequently observed among non-immunized children, particularly between 12 to 24 months. However, a nation-wide survey conducted in 2000 showed that measles vaccine coverage in Japan was 81.4%, which is not enough to prevent outbreaks "
So with a drop of vaccination of 95% needed for community immunity to 81.4% there were outbreaks of measles. And with at least 88 deaths, mostly toddlers. Are you going try to convince us those children all had health issues and their families deserved their grief? Again, where is the PubMed indexed studies by reputable qualified researchers that show the MMR vaccine causes more injury than measles, mumps and pertussis? Also where is the economic data that shows it is cheaper to treat the about one in ten who need hospitalization from measles (mostly pneumonia) than it is to provide two MMR doses per child (which total between $40 to $120 depending on medical provider)? "I will discuss MMR and SSPE in detail when I have some time!" Before you do, answer those two questions first. Then read read this. And one big warning: do not at any time speculate on the person's health, and then blame the victim for their reaction to measles. Wow, a lot of censored comments. So I'll be brief, in case this one that questions the validity of incidence data is censored. Reports of incidence are dubious because they are greatly affected by confirmation bias, i.e., diagnosing mild measles cases as something else because the patient had been vaccinated. The same applies for the converse, cases of other diseases having been diagnosed as measles prior to widespread vaccination. That phenomenon was observed during a "polio outbreak" in my state of Michigan after widespread vaccination in the 1950s, in which it was found that a large % of those who had been diagnosed as having polio were misdiagnosed. However, the likely extreme over-diagnosis of polio remained in the pre-vax era data, which makes it appear the vaccine had a much greater effect than it actually had. I've also seen anti-vax sites posting equally misleading raw data, without normalizing it by population. Therefore, I can only regard *mortality* *rate* data as reliable. I'm not sure what comments you think were censored. I haven't removed any of the comments above. The comment authors removed those. The way Blogger works, is that if the comment author wants to remove their own comment, they can do so. If I want to remove a comment, I could delete it completely. I don't do that. In fact, I don't censor comments unless they are spam, are incredibly vulgar or rude, or reveal the personal info of someone else. That is rather convoluted thinking. The reality is that measles incidence was often under-counted. Before measles vaccination, almost every child had measles by the time they were fifteen years old. The measure of mortality does not show the effectiveness of vaccines, it shows the improvements in medical care. After WWII measles mortality dropped because antibiotics could be used to treat the bacterial pneumonia that often happened after the viral disease knocked out the child's immune system. Science. 2015 May 8;348(6235):694-9. doi: 10.1126/science.aaa3662. Epub 2015 May 7. This is a good article, but it doesn't end well. You ended up with a conclusion that has nothing to do with the article itself. You say its better to get a vaccine. How can I know which option is better without even considering the consequences of getting a vaccine. They are millions of cases of vaccines gone wrong resulting with serious illnesses, disabilities and deaths. So if we have scientific study of all the numbers about illness/deaths inflicted with measles vaccines and compare them to the numbers of illness/deaths inflicted with measles, we may be able to come to some kind of conclusion which is better. The thing is we (countries, governments, humanity) are scarce at keeping real records about vaccines and diseases. Many of the countries don't even record or archive such data. The reason why everybody is so skeptical is because the governments and the pharma industry will never tell us the truth. They'v been using Thimerosal for more than 80 years and all that time they claimed the vaccines are perfectly safe. Now its been proven that Mercury is powerful neurotoxin which cause all kinds of adverse reactions, diseases, cancer, autism, SIDS and what not. If a Mercury is spilt on the floor of a hospital they will evacuate the whole building, that's how poisonous Mercury is and we injected it in our bodies for half a century. Now that the Mercury has been replaced with some other conservant, are we to believe that this new chemical is safe? They use formaldehyde in 80% of the vaccines, this is also a poison. They use human fetus dna (monkey also) which many link to autoimmune diseases. In many cases there were outbreaks of diseases introduced with vaccines. The pharma industry has lobbied its way through court to pass immunity against any adverse effect. They'v been putting Mercury in our bodies for almost a century and they claimed vaccines are perfectly safe. They have never claimed responsibility for anything and all the parents and doctors who say that vaccines are dangerous are turned into pagans who don't believe in science. In 2011, India declared itself polio free country in the big news. Little it was told that in the same year 50.000 children were crippled with a polio virus from a vaccine. If 50.000 have been crippled 10 million have been infected. Nobody claimed responsibility. So how can you believe the pharma industry, again? The trillions of dollars they have can pay thousand studies that will 'show' how perfectly safe vaccines are. The pro vaccines studies are always written by respectable and successful doctors, while the anti vaccine speakers are always lunatics who have had their licences revoked. Can you see the pattern here?